This black frame with modern scratch details complements a wide range of decorating designs. The 3 inch frame is flat and smooth creating a modern feel while adding a dash of luxury and style. 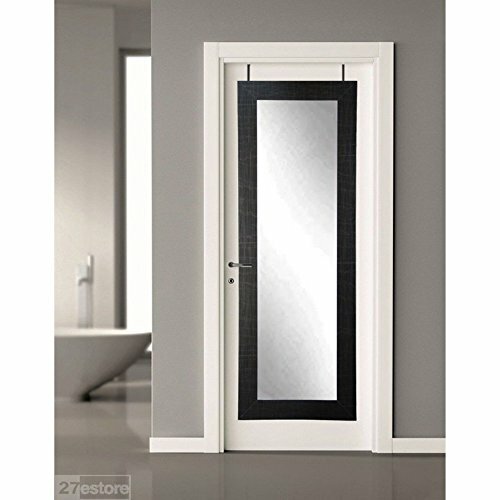 This full length door mirror is an impressive accessory to hang over a door in your bedroom, bathroom or living space. Wall hooks are also included allowing for an easy wall installation. If you have any questions about this product by BrandtWorks, contact us by completing and submitting the form below. If you are looking for a specif part number, please include it with your message. BrandtWorks Oyster Grain Floor Mirror, 32" x 66"
Bathroom Mirror Oversize Large, Corvino Black: Outer Size 45 x 35"
Headwest Metro Beaded Mirror, 20" X 32""
Howard Elliott 36016 Frameless Mirror, Oblong, 22" x 30"